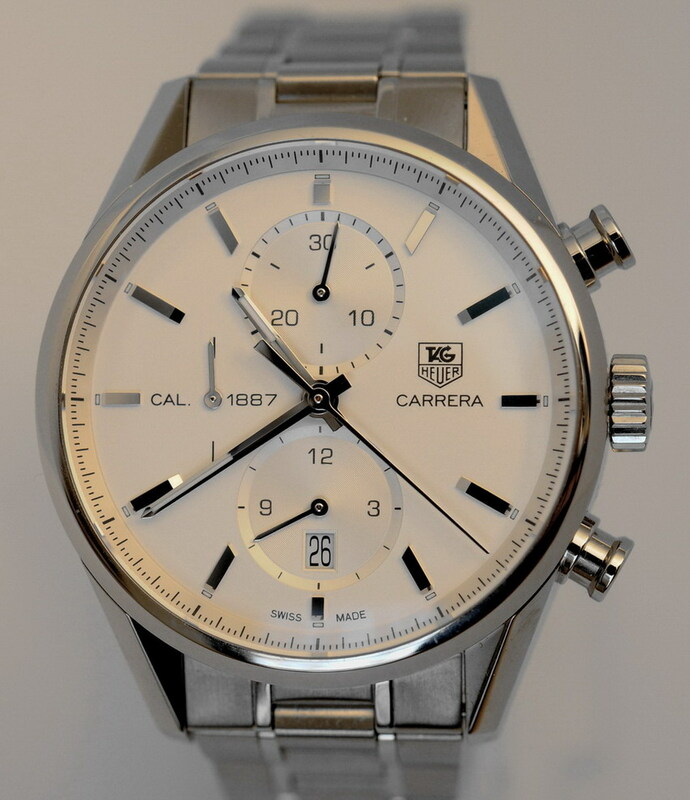 I received my TAG Heuer Carrera Cal 1887 on Friday, December 24, 2010, and have had it on my wrist almost non-stop since then. Soon, I will write an in-depth review of this watch, covering more of its features in full detail, but am posting this "Flash Review", to provide some initial impressions. The Past: The Heuer Carreras. Ed. Heuer & Co., the predecessor of TAG Heuer, introduced the Carrera chronograph in 1964. The Carrera was an icon of design simplicity -- a black or white dial adorned by 12 simple steel markers; match-stick style hands in polished stainless steel; the stainless steel case with its strong but elegant angular lugs; two symmetrical registers offered 45 minute capacity on the "Carrera 45" and three registers in "tri-compax" configuration offered 12 hour capacity on the "Carrera 12"; and an inner bezel (tension ring) with the minutes / seconds and one-fifth seconds marked with hash-marks. Movements were the Valjoux 92 for the Carrera 45 and the Valjoux 72 for the Carrera 12. In the 1960s, the Carrera evolved to offer contrasting black and white registers, date and triple calendar complications, with cases in either gold-plated or 18 karat gold. 1969 saw the introduction of the Caliber 11 automatic chronograph, housed in an entirely new case, with colorful charcoal, blue-gray, and silver dials. Later in the 1970s, barrel-shaped cases housed fume or midnight blue dials, decorated with a distinctive Cotes de Geneve finish. In 1978, Heuer incorporated quartz and LCD technologies into the Carreras; in its final iteration as a "Heuer", the Carrera used a tonneau-shaped case and a Lemania 5100 movement in 1984. 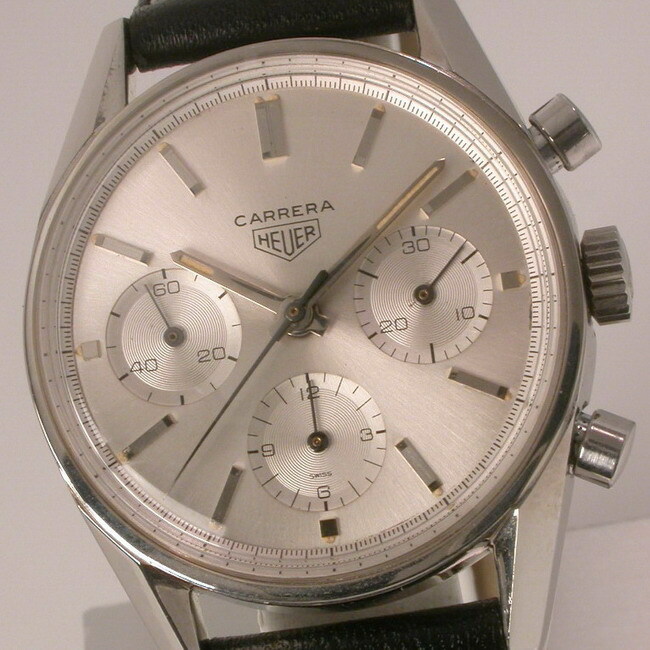 The "Carrera" name was retired shortly after TAG's acquisition of Heuer-Leonidas in 1984, but would return with TAG-Heuer's first Carrera re-issue, introduced in 1996. Since that time, TAG-Heuer has offered a broad variety of Carrera and Grand Carrera chronographs, with these being mainstays of the TAG-Heuer collection. 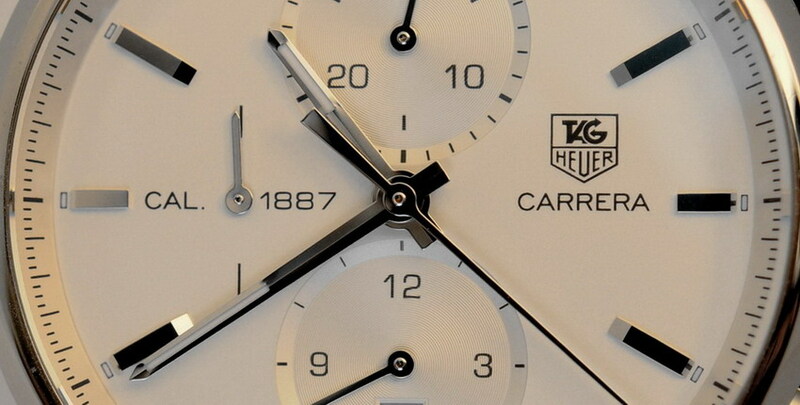 The Present: TAG Heuer Carrera Calibre 1887. The Carrera Calibre 1887 is the first chronograph to use TAG Heuer's newly-introduced Calibre 1887 movement, an in-house movement that is expected to become the mainstay of TAG Heuer's line of chronographs. The Calibre 1887 movement is an integrated movement, featuring a classic column wheel construction, with an oscillating pinion to engage and disengage the chronograph (a technology developed and patented by Edouard Heuer in 1887, which explains the designation of this new calibre). The 13 ligne movement has 39 jewels, with a power reserve of 50 hours and a balance frequency of 28,800 beats per hour. TAG Heuer produces the movement's main plate, bridges, column wheel and oscillating weight at its industrial facility, based in Cornol, Switzerland, and sources other key components (including the balance spring, the pallets and escape wheel) from Nivarox, a leading Swiss producer of escapement parts. But enough about the history of the Carreras . . . that has been written before. And enough about the new Calibre 1887 movement . . . we can put it under the microscope sometime soon. Let's have a look at this fantastic chronograph. When I first put it on my wrist, I realized that the Carrera Calibre 1887 is today's rightful successor to the Carreras of 1964. Having worn it for two days, I am confident that the Carrera Calibre 1887 lays the groundwork for the next generation of Heuer chronographs. The Carrera Calibre 1887 is a beautiful chronograph, taking the defining elements of the 1960s Carreras, and incorporating them into a state-of the-art chronograph. One by one, we see the key elements of the vintage Carreras transferred from the 1964 Carrera into the form factor required to house a modern movement. Count them off, one-by-one, the key elements that made the original Carrera the icon of simplicity and functionality . . twelve simple applied markers for the hours, yes; polished stainless steel matchstick hands, yes: inner bezel marked for minutes and 1/5 seconds, yes (although the Cal 1887 shows 1/4 second divisions, consistent with the 28,800 VPH movement); stainless steel case with distinctive angled lugs, yes. It's all here, and while the combination of design components from one era to the next will not always result an object that reflects beauty of the original object, it all works with the Carrera Calibre 1887. This chronograph looks as though it was drawn by the very same hand that drew the first Carreras, almost 50 years ago, and that is high praise indeed. 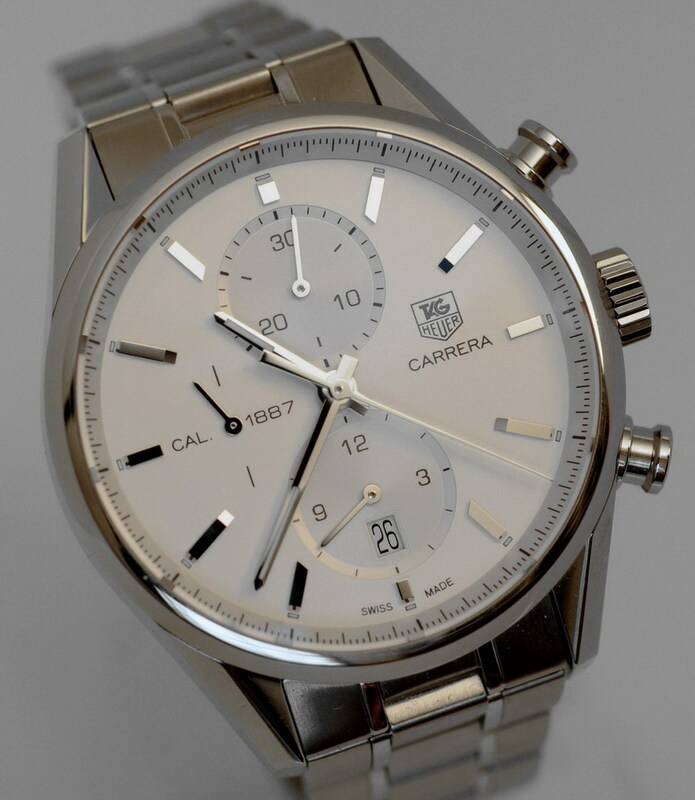 The Carrera Calibre 1887 is offered with a white or black dial, on a strap or stainless steel bracelet. The watch is waterproof to 100 meters, with sapphire crystals front and rear, and features a quick-set date and hack setting. The key difference between the 1960's Carreras and the Carrera Calibre 1887 is in the size of the chronograph. The 1960s Carreras measured 35.5 millimeters across the dial, 45 mm lug-to-lug, and had a thickness of 12.5 mm from the top of the crystal to the back of the case. The Carrera Calibre 1887 measures 41 mm across the dial and 49.5 mm lug-to-lug, with a thickness of 15.5 mm. But let me assure you -- as someone who probably spends as much time as anyone wearing the Carreras from the 1960s -- the geometry of the Cal 1887 is perfect, the proportions are right, the balance is there. Think of the Carrera Caliber 1887 as a Carrera from 1964, with its dimensions appropriately enlarged to suit modern style preferences (and to house the new Calibre 1887 movement). Mechanically, the Carrera Calibre 1887 appears to be superb. The watch kept good time in its first two days on the job, within three seconds per day. The start / stop / reset on the chronograph feels perfect, light enough that it feels like a precision instrument, firm enough that you know that you are starting and stopping the chronograph. Wearing the Carrera Calibre 1887 these last 48 hours, I have spent a good bit of time imagining what this wonderful "white board" chronograph might become. As the Carrera introduced in 1964 soon accommodated a variety of finishes and complications, I wonder how this Carrera Calibre 1887 will look with a starburst finish, with contrasting black and white registers, with a triple calendar, with a gold case or with midnight blue, fume or charcoal dials. Going beyond these cosmetic changes, I study every square millimeter of vacant space on the oversized dial and wonder whether this will become the first Carrera to offer a power reserve display or a moonphase complication. I am confident that, just as Heuer had only begun when it introduced the Carrera in 1964, TAG Heuer has only just begun with the introduction of the Carrera Calibre 1887 in 2010. 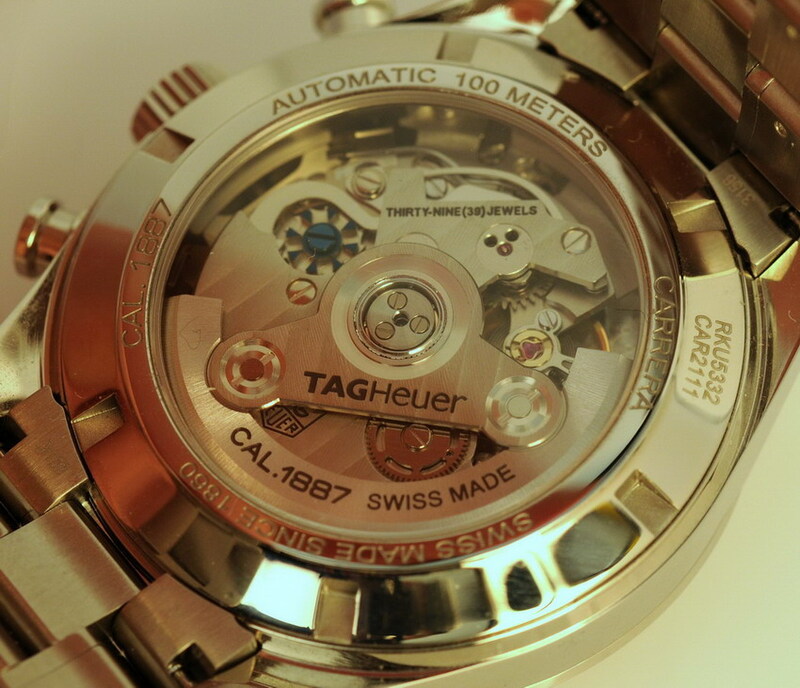 This is a perfect form factor, that will do well with the full range of finishes and complications. It's been a great ride for the Carreras, these last 46 years; it's been good fun wearing the Carrera Calibre 1887 these last 48 hours. The future looks better than ever for our treasured Carreras. The Carrera Calibre 1887 is currently available in certain markets, and will be available in the United States in early Spring 2011. Special thanks to Harrington & Hallworth, in the United Kingdom, for making this purchase almost effortless. For high resolution photos of my Carrera Calibre 1887, have a look here. I expect to add to the photos in this Gallery from time to time.